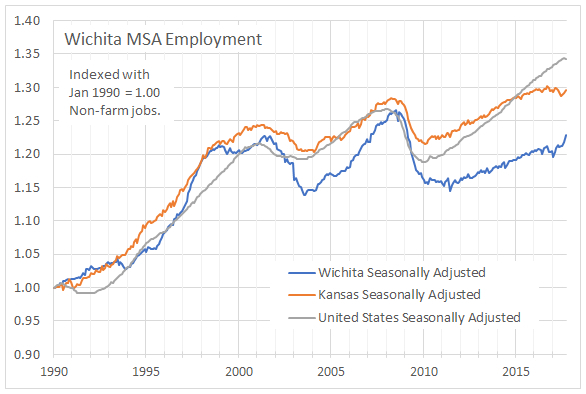 Employment in the Wichita metropolitan area is on an upward tick. 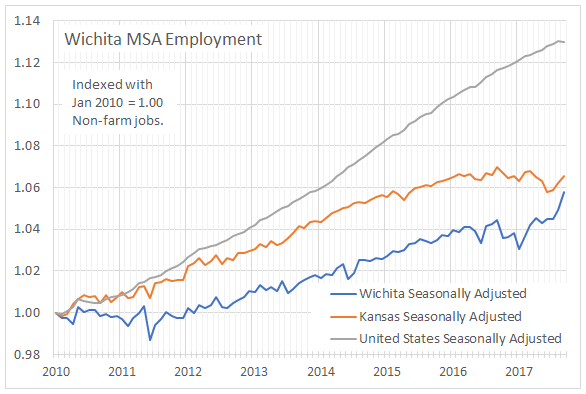 Wichita MSA employment. Click for larger. 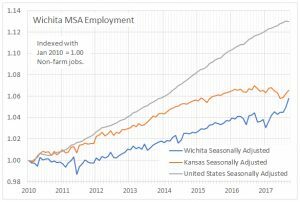 Wichita MSA employment. since 2010 Click for larger. BLS also collects data regarding employment and unemployment through the Local Area Unemployment Statistics (LAUS) program. 4 It is part of the Bureau’s Current Population Survey (CPS), which is a “monthly survey of households conducted by the Bureau of Census for the Bureau of Labor Statistics.” 5 This data is collected from a survey of households, and the monthly data is not adjusted for seasonality. This is the data series that produces the oft-cited unemployment rate. It is possible that the unemployment rate falls while the number of people employed falls or rises slowly. This is the general trend in Wichita for the past seven years or so. The nearby table illustrates this. Because the values in this data series are not adjusted for seasonality, I use the average of the proceeding 12 months. In the first example, the unemployment rate fell by nearly half for the time period chosen. (2010 was the first full year after the most recent recession ended.) That improvement was produced by a small increase in the number of employed people and a large decline in the labor force. Is our area better off for this? Local politicians and bureaucrats seem to think so, as the low unemployment rate is widely cited as a measure of their success in managing the local economy. 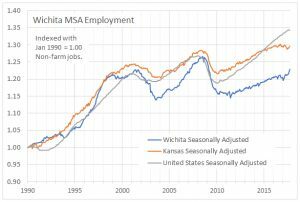 The second example uses as its starting point 2008, which was the high mark for employment in the Wichita MSA. The unemployment rate then is nearly the same as today. But both the labor force and the number of employed persons is down. If we consider only the unemployment rate, it looks like the Wichita area is prospering. But the unemployment rate hides bad news. In the nearby chart you can see these effects. The unemployment rate has been declining, although it has recently increased slightly. The labor force has been declining. The number of employed persons has increased, although it has also recently declined. 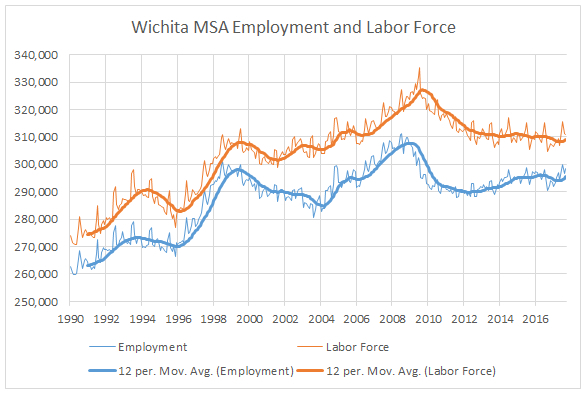 Wichita MSA employment and labor force. Click for larger. 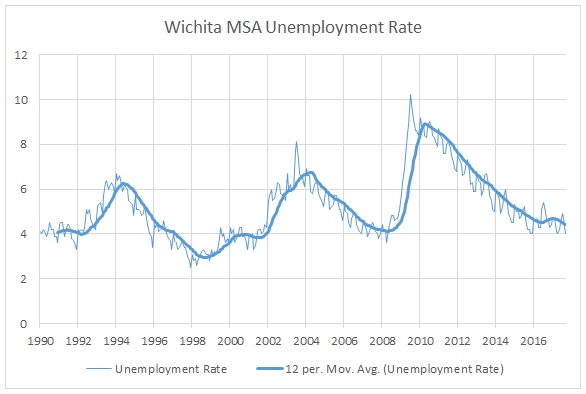 Wichita MSA unemployment rate. Click for larger. The labor force, specifically the civilian labor force, are those people working, plus those people actively searching for work, minus people under 16 years of age, minus people living in institutions (for example, correctional facilities, long-term care hospitals, and nursing homes), minus people on active duty in the Armed Forces. “The Bureau of Labor Statistics (BLS) has two monthly surveys that measure employment levels and trends: The Current Population Survey (CPS), also known as the household survey, and the Current Employment Statistics (CES) survey, also known as the payroll or establishment survey. The household survey (CPS) is designed to measure the labor force status of the civilian noninstitutional population with demographic detail. The national unemployment rate is the best-known statistic produced from the household survey. The survey also provides a measure of employed people, one that includes agricultural workers and the self-employed. A representative sample of U.S. households provides the information for the household survey.